DBpedia status information: not available. 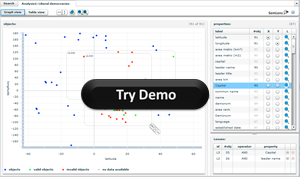 Do you want to analyse trends and correlations in RDF data? SemLens is a visual tool that allows to arrange objects in a scatter plot and to analyze them by user-defined semantic lenses. The lenses can be independently defined for each of the objects' properties and can be combined by logical operators. The scatter plot provides a global overview and supports the discovery of dependencies and correlations also in large datasets. The semantic lenses facilitate the local analysis by providing an intuitive metaphor for the definition of semantic filters. SemLens is based on the open source framework Adobe Flex and uses SPARQL to access RDF datasets. SemLens is readily configured to access RDF data of the DBpedia project and only requires a Flash Player plugin to be executed (which is usually already installed in web browsers). Since most DBpedia data has been automatically extracted from Wikipedia and other sources, it cannot be expected to be 100% complete or correct. If you want to help improving the data, read about how to contribute to DBpedia. SemLens: Visual Analysis of Semantic Data with Scatter Plots and Semantic Lenses. In: Proceedings of the 7th International Conference on Semantic Systems (I-SEMANTICS 2011), pages 175-178. ACM, New York, NY, USA, 2011. Philipp Heim, Steffen Lohmann, Davaadorj Tsendragchaa and Thomas Ertl.